In the article ‘So you want to be an olympian’ I looked at whether you are born an athlete or become one with training. I concluded that in most sports, body shape is not of primary importance. However headlines this week have highlighted that size can matter, as a number of Formula One drivers state their concern that next year’s weight rules will push the taller and heavier drivers out of the sport. The new 2014 regulations for Formula One increase the combined weight limit for car and driver by 48 kilograms (7.56st), to 690 kilograms (108.66st) but as the 2014 V6 turbo engines are at least 50 kilograms (7.87st) heavier than existing models, this will put pressure on driver weights. The motor sport press has reported that highly regarded Sauber driver Nico Hulkenberg “missed out on a seat at Ferrari next season and is being viewed skeptically by other top teams” because, at 6ft and 78 kilograms (12st 2lb), his weight will be a disadvantage under next season’s rules. Red Bull’s 6ft Australian driver Mark Webber (75Kg, 11st 11lb) has responded by saying he “hasn’t eaten for last 5 years” and suggesting the perfect driver weight is already between 9st 6lb and 10st 3lb (60-65kg), hinting that this is one of the differences between his performance and that of his team mate Vettel who at 64kg (10st) is one of the lightest drivers. Jenson Button at 6ft and just 70Kg (11st) is outside this weight band but is widely acknowledged as being one of the leanest drivers in the sport, with a body fat percentage of just 6%. With many of the top earning sports personalities from athletics, football and tennis also reported as having single digit body fat percentages it is perhaps worth looking at what body fat percentages and investigating what is a healthy level for sports people. Body fat percentages are increasingly being used instead of BMI as a measurement of healthy body weight. A body fat measurement consists of both essential body fat and storage fat. Essential body fat is the fat that is a constituent part of brain tissue, nerve tissue, bone marrow, organs and membranes and we need this fat for our bodies to function properly. Storage fat, on the other hand, is not essential and is a measure of the fat stock-piled as an energy reserve. Storage fat is built up when more ‘energy’ is eaten than used and can later be broken down when needed. 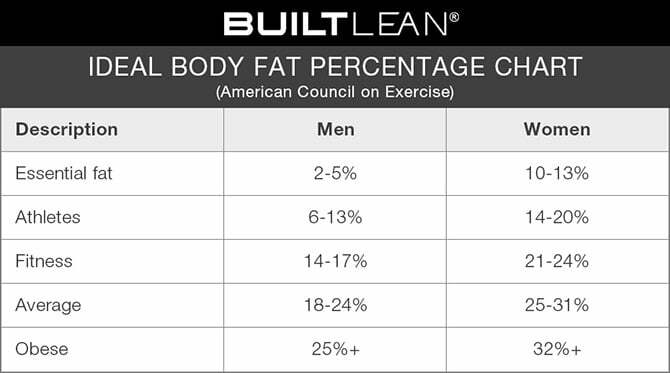 The chart below is from the American Council on Exercise (ACE) (1) and is one of the most commonly used to show body fat percentages across the population. This table would suggest that Jenson Button is at the bottom of the healthy body fat range for athletes, however, there is a lot of controversy over what fat percentage is optimal for overall health. Some research papers have suggested that certain low body fat ranges are “underfat”, implying they are “unhealthy”, for instance Gallaher et al 2000, suggest 20-40yr old men who are under 8% body fat are “underfat” and a “healthy” range is 8-19%. For women in the same age group, any level under 21% was called “underfat” and 21-33% “healthy” (2). However American research on 528 male and 298 female olympic athletes participating in 26 different events, showed that most elite athletes had body fat levels well below average, the exception being sports in which body weight is supported, such as canoeing and swimming. In these sports body fat averaged 12-13% in men and 19-22% in women but athletes involved in sports where a weight class had to be made or in anaerobic events like the 100, 200, and 400 meters or the marathon, fat percentages were around 6-7% in men and 13-14% in women (7) and there is no evidence of any health issues. but weight issues are now being reported in a large number of sports and many professional athletes across a wide variety of different sports now feel under pressure to increase muscle mass to weight ratios, lowering their body fat percentages into that 6-14% range. Average body fat percentages found in research into different sports are shown below (5). *Research on male footballers has found percentage of body fat varies from 6.1 to 19.5%, with midfielders showing higher fat levels than either forwards or backs. Perhaps the most extreme examples of low body fat are seen in jockeys, who under pressure to make ‘the weight’ have been documented with body fat percentages as low as 2.5%. A recent review of nutritional practises showed that a high proportion of jockeys did not meet any of the recommended daily intakes of food, failed to meet the estimated average requirement and lower threshold intakes for most micronutrients and consumed well below (0-2) the recommended five daily servings of fruit and vegetables. Poor diet along with the acute weight loss strategies including the use of saunas (86%), exercising to induce sweating (81%), restricted energy intake (71%) and smoking (38%) to keep to these low fat percentages, almost certainly increases the risk long-term health issues (6). Poor nutritional practise has also been widely reported in gymnasts and boxers but may now be feeding through to other sports. Motor Racings David Coulthard admitted in his autobiography that he was bulimic as a teenager. The Scot was nearly 6ft tall but weighed just nine stone and was determined not to get any heavier in order to ensure he got on in the sport and Liz McColgan says that while she never suﬀered a full-blown eating disorder, she “touched the base of anorexia” in 1988 after a coach told her she needed to lose a few pounds to run faster. She “cut down on what she ate” and went into the Seoul Olympics “way too light and undernourished”. Your body needs a certain amount of fat for cushioning joins, regulating your temperature and the distribution of nutrients. As well as lacking the energy to compete successfully, without enough body fat, female athletes may cease to menstruate, a condition that can lead to decreased bone density and all athletes experience impaired endurance, body temperature instability and increased impact on the joints. In 1996 the British Athletic Federation (the predecessor of UK Athletics), worried about low body weights formed an advisory group of medical experts to look into the problem. Since then, members of the UKA advisory panel have worked closely with the eating disorders charity, Beat, to provide support for athletes who are suﬀering from eating disorders. In the late 1990’s it was estimated that one in five female distance runners had suffered an eating disorder, in research at Leeds University it was found that from 184 elite female distance runners a total of 35 (19 per cent) had an eating disorder or had suffered from one in the past (8). In 2012 the UK’s first clinic dedicated to treating sports people with the eating disorders anorexia and bulimia nervosa National Centre for Eating Disorders in Sport opened at Loughborough University. So, yes, you may have to be thin to win. But you can also be too thin to win. Although there is certainly an advantage in not carrying excess fat when competing in endurance or gravitational sports, there must be a good balance and neither diet nor hydration should be compromised to reach your goals. Larder and Gym can advise you on all aspects of nutrition to meet your competition and training demands without compromising your health. Meyer NL, Sundgot-Borgen J, Lohman TG et al Body composition for health and performance. A survey of body composition assessment practice carried out by the Ad Hoc Research Working Group on Body Composition Health and Performance, under the auspices of the IOC Medical Commission, accepted BJSM, Nov issue. Table taken from Jeukendrup & Gleeson Sports Nutrition second Edition. Human Kinetics. Soccer numbers updated from Wittich et al 2001. Body composition of professional football (soccer) players determined by dual X-ray absorptiometry. J Clin Densitom. 2001 Spring;4(1):51-5. Dolan et al 2011, Nutritional,lifestyle and weight control practices in Professional Jockeys. J Sports Sci 29(8):791-9.